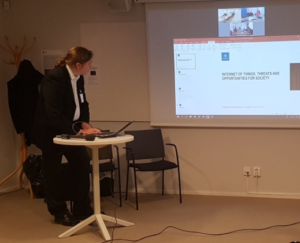 SCDI researchers Juho Lindman and Ted Saarikko visited the Swedish Civil Contingencies Agency (Myndigheten för Samhällsskydd och Beredskap, MSB) on April 19th to present their report Internet of Things: Threats and Opportunities for Society. The report provides a theoretical overview of IoT as well as the results of an empirical study of Swedish government agencies. The report is intended to serve as a precursor to further MSB-funded research into the societal implications and possibilities of IoT. The report may be downloaded free of charge from the MSB website.